Combining a revolutionary five-sided parabolic reflector with an axial filament Philips bulb, Cr5 Pentabeam Technology generates an extremely bright, virtually perfect beam of light to eliminate dark spots, cast a broad spectral pattern and reach distances of up to one-half mile. Golight Cr5 Pentabeam brings more power to you, anywhere you go. 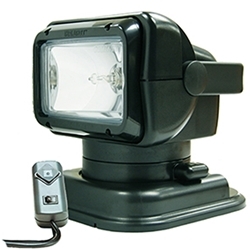 Control the direction of the beam with the convenient wired remote control. Please allow for an additional 1 - 2 business day processing time on this item.